There’s three ways of getting to the center of Lisbon from the Portela airport. A taxi is not necessarily more expensive then the bus connections. It depends on the number of persons you’re travelling with. Portela airport is located at about 7 kilometers from Lisbon’s city center, a ride to the city in normal traffic shouldn’t take longer then 15 minutes. It is possible taxidrivers will try and charge more for the ride than the normal price. Make sure they switch on the meter. It is illegal for taxidrivers to charge more then the official rates in Portugal and there are penalties. So if you encounter a problem, make sure that you let them know that you might contact the police. Hint about taking a taxi at the airport: if the queue is too long at the arrivals you just have to go upstairs to the departures area and take a taxi there. 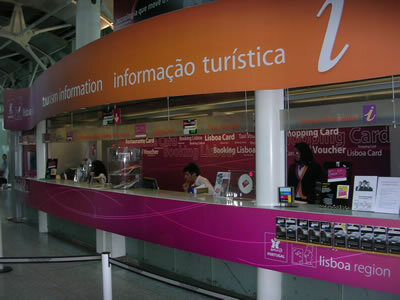 Airport Portela Lisbon, Tourism information center – Arrival Hall. Here you can buy a voucher for pre-paid taxi transfers to the city center with fixed prices. Each taxi carries up to 4 (or more) people, including all the luggage that can fit in the trunk. A taxi to the center shouldn’t cost more then 12-14 euros, luggage included. The taxidriver will charge you for the luggage (if you have luggage that needs to be placed in the trunk of the car). There’s a special bus (Carris Aerobus 91) that brings you to the city in about 20 min. From 07:00 to 23:00, costs € 3.50 one way or € 5.50 round trip. You can buy the ticket inside the bus, free use of the metro’s and other buses in the city during the same day is included. You can also take normal buslines, which are a bit cheaper. 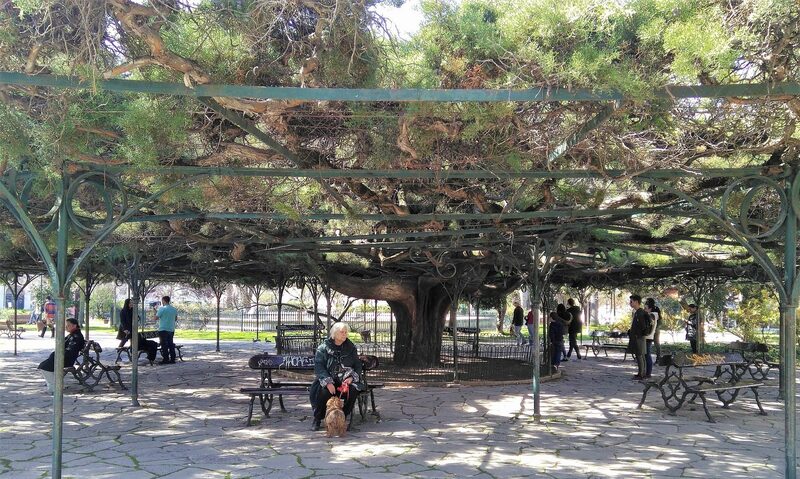 The buses 5, 22, 44, 45 and 83 will take you to areas in or around central Lisbon. The (new in 2012) airport metro station is located just outside the arrivals and departures building. From 6 am to 1 am, it costs around 2 euro to Lisbon’s city center. 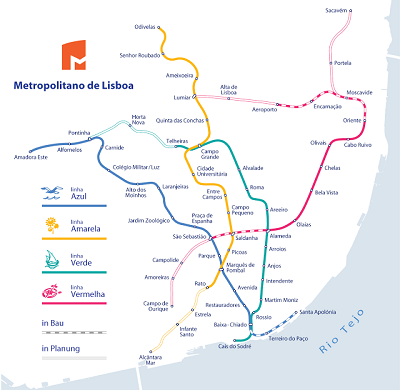 Map of all metro stations in Lisbon. The new aeroporto (airport) station: red line (linha vermelha). 6:00 am and 9:00 pm and of 2.50 euros from 9:00 pm to 6:00am. The same 2.50 euros apply for the 24 hours of weekends and holly days . As for the extras, there are 4 supplement fees allowed by law, each worth 80 cents ( 0.80 euros). If you make use of the trunk ( wich you must if your luggage is bigger than aprox. 40×50 cm.) two (2) supplements ( 2×0.80euros = 1.60 euros) will be charged (for the all trunk, not for each piece of luggage). If your hotel calls the service you will be charged another supplement (0.80 euros) and if you travel with a pet ( dogs, cats, parrots, a.s.o.) you will have to pay another 0.80 euros, that making the maximum of supplements of 3.20 euros. Unless previous agreement, no other charges,( appart from road pay tolls) may be applied. The mentioned 10 euros fare from the airport to the center is a good reference. Aerobus 91 is a perfect way to get to various parts of the city. There is plenty of stops, so you can easily hop off close to your hotel. If you buy a Lisbon Card at the airport, the fare is only 2 euros. I would like to know if the taxi’s from the airport have space for 4 people (and their luggage).